Xamarin VS2017 CrossPlat Android target 5.1 Lollipop...Cant get right combo for error free? Is there a correct soup of these settings that gives 0 errors for a desired Android app for 5.1 Lollipop using cross platform C# Xamarin VS2017?? Im just trying to find out the right settings to get error free android app for a 5.1 Lollipop phone. If I am right, you have downloaded the project, and there is something wrong when you built it? Can you show the error for us? And share the demo's link with us? Elandaloussiishrak, thank you for your help. I briefly had a task doesnt match target, but that cleared when I reopened VS2017. Hi, There is a difference between API level and Target Version, If you giving target version Lollipop then you to select API level according to that. Like if you are using Oreo 8.1 then you will have to use API level 27.0.0.1 or above. So as for Lollipop, it will be 22 or 21 api level. Only 1 error, but not sure how to understand it. Is there a better version of 22 or 2.0 ??? Error The "Xamarin.Forms.Build.Tasks.FixedCreateCSharpManifestResourceName" task could not be loaded from the assembly C:\Users\m.nuget\packages\xamarin.forms\2.0.0.6490\build\portable-win+net45+wp80+win81+wpa81+MonoAndroid10+MonoTouch10+Xamarin.iOS10\Xamarin.Forms.Build.Tasks.dll. Confirm that the declaration is correct, that the assembly and all its dependencies are available, and that the task contains a public class that implements Microsoft.Build.Framework.ITask. It makes sense to use api 22. But, I still have one error as you see in the previous post. Maybe I still dont have the correct versions of 22 and Xamarin. Forms 2.0 ??? There is any solution for the error: "NU1202 Пакет Xamarin.Android.Support.Design 25.4.0.2 incompatible with monoandroid51 (MonoAndroid,Version=v5.1). 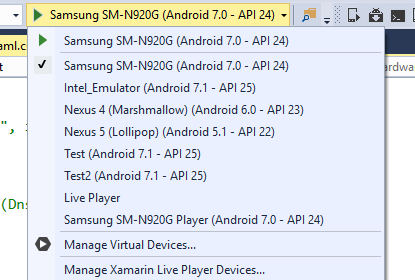 Пакет Xamarin.Android.Support.Design 25.4.0.2 supports: monoandroid70 (MonoAndroid,Version=v7.0)" ?